“The Voice” season 7 continues its quest for the best singer this season with the beginning of the Knockout Rounds featuring Country singer, turned Pop singer Taylor Swift as the coaches adviser. Adam said the Knockout Rounds is “where stars are born. Everything else up to this point was just try-outs.” Pharrell said “It’s about more than technique, it’s about personality.” Taylor Swift said about “The Voice” contestants, “they all want to make their own mark.” Blake said Taylor will have a ton of great advice. In the Knockout Rounds, the coaches have one last final steal. All coaches will have Taylor Swift as their one adviser. The contestants pick their own songs, and the right song is so important. Bryana chose to sing “Heart Attack” by Demi Lovato. Sugar Joans picked “Love on Top” by Beyonce. Gwen said she wants people to feel like they know Sugar after she sings the song. Coaches Comments: Blake said to Bryana, “It’s not normal for someone as young as you to do that – OMG, LOL!” Pharrell said “Bryana you’re ready to…do things that are really natural for you.” He told Sugar that he was upset he didn’t turn around for her and promised to steal her if she didn’t go through. Coach Gwen said Sugar’s performance was “so well done,” and “it was really perfect.” Gwen told Bryana she went to her soft voice “perfect” as well. James is singing “If You’ve Got a Friend”. Blake told James to find a place to hit a big high note somewhere in the song. If he doesn’t, Blake worries people will forget that he’s a great singer. Blake is sure Griffin will hit a high note leaving James bringing a knife to a gun fight. Griffin chose to sing “As Long as You Love Me” by Justin Bieber because it’s a “Poppy song” and he wants to put his own twist on it. Coaches Comments: Pharrell who was Griffin’s former coach, said he doesn’t know what Blake’s going to do. Gwen said she had goosebumps from James, and Griffin’s voice was “super-powerful”. But, James was “believable” and Griffin is still trying to find his voice. Adam said the problem for him is that they were so surprised by Griffin’s last performance, and this song was “super-safe”. Coach Blake said he was surprised at Griffin’s song choice, but it was the first time he was wrong. Blake chose James and said Griffin did a good job, but not the job he did in the battle rounds. DaNica chose “Saving All My Love For You” by Whitney Houston. Danica said she’s inspired by Whitney and her husband. Katriz chose “Superwoman” by Alicia Keys. Katriz said she’s dedicating the song to her mother. Coaches Comments: Gwen said she always thought Danica is “off the charts” and that Katriz has so much stage presence and said both did an amazing job. Adam was amazed by 15-year-old Katriz’s voice, and Danica is “the one to beat” and must keep raising the bar. He Called Danica a “perfect signer.” Coach Pharrell said Katriz has grown. Danica is “like a unicorn” and has been through an incredible transformation. Pharrell chose Danica as the winner. 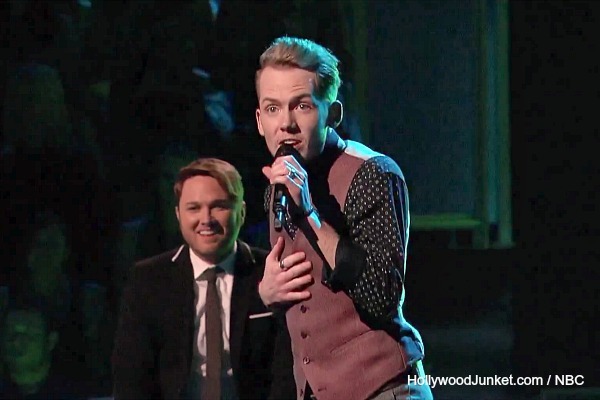 Coaches Comments: Blake said about Damien’s song choice, it’s not that often that he knows the songs on the show. But, he gave his vote to Toia . Pharrell told Damien “that was a flawless performance.” He said Toia dug in and came back with a serious vengeance and “you just tore this place down.” He chose Toia. Gwen said “it was a great song for Damien.” Gwen said she was shocked by Toia. All the coaches chose Toia as the winner. Adam said the LeAnn Rimes song does tip its hat to R&B and he commended Damien for seeing that . Adam said he might regret making his decision based on what he hopes to hear in the future versus what he’s already heard. The person who is the most prepared for future rounds he said is Damien. Jessie chose to sing “Your Song.” Tanner picked “Calling All Angels” by Train. He said the song represents the type of artist that he wants to be. Blake was shocked by his choice because “that’s a heck of a vocal for that kid.” Taylor said Tanner was “working the cute boy factor” during his rehearsal. Coaches Comments: Pharrell said the winner was Jessie because she showed him “all the keys!” Gwen said Taylor has come really far, and was a great performance. She said she was devastated to loose Jessie, and her performance was “off the charts.” Adam said Tanner sings like his 6’2″ and 250 lbs. “It’s a total dichotomy to what he sings like and sounds like,” said Adam. He said that Jessie is only going to get better. So, Adam chose Jessie. Coach Blake said that Tanner is starting to become a presence on the stage. He said he’s going to to go with who has a clear vision of what kind of artist they want to be. He chose Jessie. Pharrell said he picked the two because they both have “a bit a soul in both of them and a bit of rock and roll,” and they both had 4 chairs turn for them. Luke chose to sing “Rich Girl” by Hall & Oats. He wants to show people that he can make a Pop song his own. Taylor said this song is different from other Pop songs. Taylor Swift told Taylor that his guitar is “a Teddy Bear” because he used it for only seven seconds and advised him to sing without it. Pharrell advised Taylor to give more emotion. Taylor said he felt outside of his comfort zone without the guitar. Coaches Comments: Gwen said Luke had such command of the stage, and it’s fun to see Taylor without the guitar and it was like a performance she’d see in a festival setting. Adam said he got to see the other side of Taylor, and that there’s no winner. “It’s the best apples and oranges the show has.” He said he’s prepared to steal. Blake said about Luke that there was so much ad-libbing in Luke’s song. He chose Taylor. Coach Pharrell told Taylor that he really let the world in and let them see what makes him tick. He said he would have shaved off some of the things that Luke did. He chose Luke as the winner. Pharrell said he thinks Luke can win “The Voice”. Steal – Adam and Gwen both pushed their buttons to steal Taylor. Adam tested Blake’s button. Then Blake pushed his button. Adam said to Taylor, “I’m shocked that you’re available; up to be stolen” and told Pharrell that he made a mistake. Adam reminded Taylor that he fought to get him on his team before. Gwen said she’s never made a mistake and he should go with her and called him “a real artist.” Blake said he thinks Taylor displayed the most artistry and that he thinks “Taylor won that knockout round.” Taylor chose to be on Team Adam. Taylor is now on Team Adam.